The Alchemist mixes herbs, gathered by Herbalism, and reagents in order to generate elixirs, potions, oils, flasks and cauldrons with a variety of effects. A player can create healing, invisibility, elemental resistance and mana potions; oils to coat weapons, consumables to increase stats, and much more. Scroll down for the new stuff or just click here to skip to it. Many Alchemical potions and flasks are considered a necessity when raiding and are also useful for a number of other occasions. Due to this, Alchemical products are constantly in demand on the Auction House and in guilds. Alchemy is useful to all character classes. Melee fighters can use alchemy to create buffs and healing potions. Spell casting classes can use alchemy to create mana potions and related buffs. You can create potions for yourself, sell them to others, or give them to your party members and friends. Alchemists are well loved when they hand out potions. Alchemy also grants the ability to transmute items, such as turning lesser jewels into a rare jewel, or Sorcerous Something into Sorcerous SomethingElse, another skill in constant demand. Profession Perk: Mixology – this increases the effect and duration that you get from your own potions. It works out to +80 of your best stat at level 85 for potions similar to Flask of the Winds. Profession perks are dead in Warlords of Draenor. Alchemist’s are able to craft a unique alchemical trinket for themselves. Warlords: Draenic Philosopher’s Stone – This item can be raised to item level 685 in Patch 6.1 and 715 in 6.2. Selling potions, elixirs and flasks that you create, as well as transmuted Jewelcrafting gems (or using them yourself if you have a Jewelcrafter) can provide you returns on your investment, making the costs of leveling the profession easier to bear. In warlords you could buy the cheapest of the Sorcerous elements, transmute them into the most expensive, and resell those. For example, if Sorc. Air was selling at 20 gold a pop and Sorc. Fire at 40, then you buy up as many of the former as is worthwhile, transmute, and resell. A good profession to level alongside with Alchemy is Herbalism. Finding/growing your own Herbs allows you to avoid paying a good deal of the sometimes exorbitant prices on herbs at the auction house. Note that picking old world herbs, with everyone else in the new world, might be quite profitable. First off, none of the bits in the charts below this section are obsolete. In fact, if you’re under level 90 and you want to level your Alchemical skills, you’ll pretty much have to follow that list. Once you hit 90 though, and enter Dreanor, you can take your level 1 skill and level it to the max without ever entering the old world, except to buy materials. None of the old recipes will be needed. Under 90? You’ll need all the old stuff and will visit your trainer to learn new recipes. 90+ (and in Draenor?) You will need none of the old stuff, though you’re welcome to buy the old recipes anyway. By the way: you no longer need to see your trainer to buy access to new skill levels. You’ll need to see him to buy new recipes, just not for the skill bump. Alchemical Catalyst – needed for transmutations and a few other things. You will have a daily recipe to make these as well as making them through your Garrison work orders. 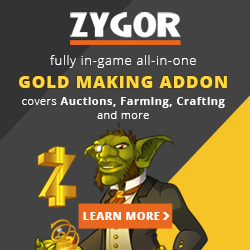 Secrets of Draenor Alchemy – lets you buy more recipes, which you will want. Crescent Oil – a basic crafting materia. Draenic Mana Potion – restores mana. Draenic Swiftness Potion – faster run and swim for 8 seconds. Draenic Invisibility Potion – Invis for 18 seconds. Draenic Water Breathing Elixir – 1 hour water breathing. Draenic Living Action Potion – 3 second PvP escape trinket. Pure Rage Potion – 75 Rage right now. Draenic Water Walking Elixir – Walk on water for 10 min, in case you don’t have the Water Strider mount. The scroll (A Treatise on the Alchemy of Draenor) is awarded at the end of the questline started by using that Mysterious Flask which you found from Draenor mobs or from Karnoth during Shadows Awaken. The subsequent quests will vary depending on whether you’re Horde or Alliance. First off, note that you can level from 1 to 700 entirely with Draenor materials. You do not need to see your trainer for skill bumps, new recipes, or anything else. Now if you’re 90+ and your skill is less than 600 just hop over to the Auction house, buy an appropriate amount of Crescent Saberfish Flesh (to make Crescent Oil) and level your skill to 600. How much? You will need 3 flesh for each point of skill. If you have 37 points to go you will need 111 pieces. If you have 600 skill points to go you’ll need 1800. Yes, the skill will stay “orange” from 1 to 600, another new feature with Draenor. If you have the Fishing skill you can catch a ton of Crescent Saberfish (found everywhere,) prep ’em, and make your oil from that. Once you hit 600 the recipe will go gray and you’ll need a new recipe. You can buy these recipes from your garrison recipe seller for one Secrets of Draenor Alchemy each. You can only make one “secrets” per day, so pick one that’s interesting. You can use any of these recipes to work your way to 600, as well. It just depends on whether you want those potions/flasks, and have the mats, or you’re happy with the oil. By the way, you can catch the Saberfish from your Garrison pools and pluck the herbs from your herb garden. In 6.1, several new recipes are acquired through a randomly-spawning vendor in your Level 3 Town Hall: Samantha Scarlet and Nicholas Mitrik. These recipes are not sold by your usual Garrison and Ashran recipe vendors. It may be a number of days before you actually see the vendor in your town hall. Perhaps some generous guild-mate will let you use the vendors in their garrisons. You do want to assign a minion with the Alchemy trait to your Garrison Alchemy lab. Why? Better work order production and… Free Potions!! Every day your follower will cook up potions for your use. You get four doses and they’re soulbound, so no selling them or donating them to your guild, or even your alts. The stat potions increase your stat by 1,000 for 25 seconds. Just the thing to add to your “one shot” macro. 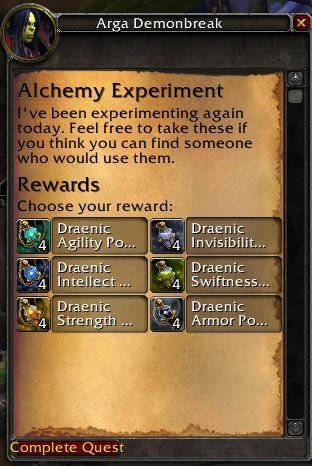 They’re all free, just a bonus for having the good sense to assign a follower to your Alchemy lab. Once you hit 600 the above recipes go gray. So what to do? Do your daily Alchemical Catalyst for 10 skill points. 10 days of this and you’re at 700. You will need 20 Frostweed and 10 Blackrock ore each time. Your Garrison mine and Herb Garden will supply both, or you can go out into the world and gather them, or buy them from the Auction House. 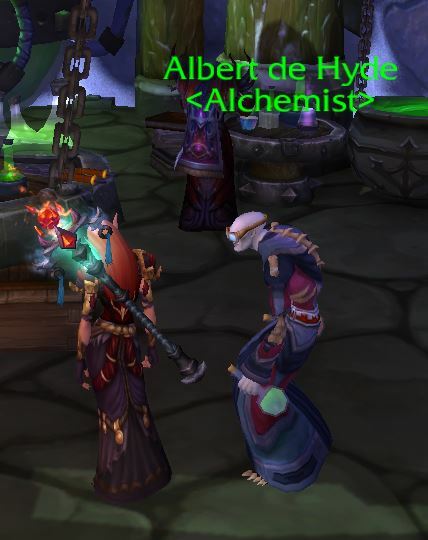 If you have an Alchemists Hut in your Garrison you can create these Catalysts through work orders. Your daily Secrets of Draenor Alchemy will provide one skill point. Once you have 50 Alchemical Catalyst you can do a Transmute: Savage Blood for ten points. You will also need 7 Crescent Oil for each item created. Buy the recipe for Draenic Intellect Flask (Or Str, Stam, or Ag) and make a big stack. They will provide one skill point each. It will stay “yellow” until 700. The Draenic Philosopher’s Stone is a pretty nice little trinket to be using, with its big stat proc and boost to your healing potions. You create the initial stone and the, in four steps, you can boost it to 685 (715 in 6.2) You will need to get the recipes from the the vendors mentioned above to create these trinkets. The trinket to be upgraded. The end result, in 6.1, is the Stone of Fire. Rather expensive. All the other crafted item from any profession are similarly expensive. Elemental Distillate upgrades the Stone of fire to 715, for 350 Alch. Catylysts, 60 Sorcerous Fire, and 60 Felblight. Yes, that’s 1,175 Alch. Catalyst total (plus all the other stuff) to get one trinket to 715. Ouch. If you’re under level 90 and under level 600 skill, then just skip to the appropriate place in the table below. Remember that you no longer need to talk to your trainer about leveling your skills, that will happen automatically. Apprentice Alchemist, Requires level 5, range 1-75. Train Journeyman Alchemy, Requires level 10, 76-150. Train Expert Alchemy, Requires level 20, 151-225. Train Artisan Alchemy, Requires level 35, 226-300. Train Master Alchemy, Requires level 50, 301-375. Train Grandmaster Alchemy, Requires level 65. Train Illustrious Grand Master Alchemy, Requires level 75. You will need to either create a Philosopher’s Stone or an Alchemy Trinket before continuing. Train Zen Master Alchemy, Requires level 80, 526-600. Congratulations on your Maxed Alchemy skill! Level your crafting the easy way. This guide is an in-game guide to leveling all of your professions and to getting all of those achievements. Everything you need to do and get and everywhere you need to go is all covered! Mixology isn’t a specialization, it’s a profession perk, and you get it from day 1. The specializations are initially obtained by completing a quest that any Alchemy trainer can give you. Once the quest is complete then you have a bonus proficiency in the specialized area, which will result in creating a few extra potions/flasks/etc. You can change specialization later by dropping your specialization in the Professions tab of your spellbook and accepting the quest for a new specialization. You will have to buy/create a few new potions when you do that. Transmutations change a lesser something into a more rare something. Such as Elementium ore into Pyrite ore, or lesser gems into superior gems, or Sorcerous this into Sorcerous that. Click here for available Transmutations. Warlords alchemy research consists of obtaining the scroll that teaches you Draenor Alchemy, and then the scrolls from the appropriate trader (as mentioned above.) There is no daily discovery as there was previously. Northrend Alchemy Research allows you to discover new recipes, with a three day cooldown. From WoWwiki: You have a small chance to discover a recipe from a specific list of discoverable recipes every time that you perform a transmutation or that you make a potion, elixir, or flask that was introduced in the Burning Crusade or Wrath of the Lich King. The discovered recipe is learned automatically. Non-factors include physical location, level, and skill level. Cauldon recipes seem to have the highest chance of being discovered, and the discovered recipe will be in line with the recipes being created. IE: Creating Shadow potions might result in a Shadow cauldron recipe. No special skill or character level, location, or recipe color (orange, etc.) is required for a discovery. There is a tiny chance that it will happen and that’s about it. Transmuting Titanium or using one of the epic gem transformations seems to have a higher chance of discovering a new transmutation recipe.